Rosedale Place neighborhood provides the attractive clean lines and comfortable new homes you’re looking for in North Bossier City, Louisiana. This lovely gated community located just east of Airline Dr. and to the North of Wemple Rd. 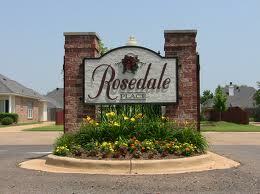 provides a quiet place to come home to while only a few miles from the heart of Bossier City. An HOA fee of $59.40 per month covers your trash and recycling removal, lawn care for the front yard and flowerbed maintenance as well as lawn care for the community areas like the clubhouse. The clubhouse can be reserved with a $50 refundable deposit for parties and events. There is also a community pool so your family can enjoy those hot summer days with plenty of cool water fun. This covenant-protected community ensures a safe and well-groomed exterior that not only gives you a little peace of mind, but ease of maintenance saves you time too. The nearest Bossier Parish schools are Plantation Park Elementary, Apollo Elementary, and Airline High School all located to the South, with Legacy Elementary and W.T. Lewis Elementary to the east. Also to the South you’ll find Willis-Knighton Bossier Hospital and Promise Hospital of LA as well as a whole host of dining and shopping opportunities. Rosedale Place likes proximity to convenience, while lying just outside the congestion of city life.